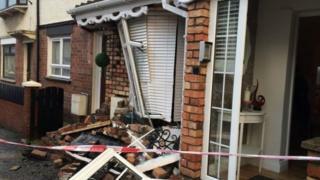 A 19-year-old has been jailed after crashing a stolen Range Rover into a house in Belfast. Caoimhin James Black, of Conway Place in Belfast, admitted two counts of aggravated vehicle taking, causing damage to the Range Rover and a parked car. In the early hours of 3 January 2018 Black drove into a house in Cavendish Street after striking a parked car. On Tuesday he was sentenced to four months in prison. The crash caused £38,000 of damage to the Range Rover and the parked car as well as extensive damage to the house in west Belfast. At Newtownards Magistrates' Court on Tuesday, a district judge told the teenager: "The maximum I can give you is six months but I have to give you discount for pleading guilty so it's four months in each count concurrent and disqualified for two years." He warned Black that "if you come back in front of me for the like of this again, I will make sure that jurisdiction is refused". He added: "You can't keep doing this to people's property and people's lives and you will face a lengthy, lengthy custodial sentence - we are not talking months, we are talking years." A prosecuting lawyer told the court the keys to the Range Rover and a Toyota C-HR were taken during a burglary at a house on Carney Hill in Holywood, County Down. The lawyer told the court that at about 05:00 GMT the stolen Toyota was driven into a lamppost in Glenmachan Street and a short time later, the stolen Range Rover driven by Black crashed into a parked Seat Leon in Cavendish Street before ploughing into the front of a house, causing extensive damage. CCTV footage captured Black getting out of the driver's seat of the crashed Range Rover and after "names of those involved were received by the police," Black was arrested. Forensic examination of the Range Rover uncovered Black's DNA profile from the steering wheel, the court heard. During police questioning, Black refused to answer questions. Black's defence lawyer conceded there was "no denying" his relevant criminal convictions but submitted that he was going through a "completely destructive time in his life" and that he had since strived to get help and support. "He now realises, with an adult head in his shoulders, that he cannot continue in this way," the lawyer said.